Cut a big rectangular piece out of the construction paper. Fold it in half to make a long, thin rectangular shape. Along the fold line of the paper and make a series of cuts - about a dozen or more. Don't cut all the way to the edge of the paper. Unfold the paper and glue/staple its short edges together. 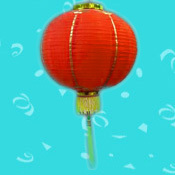 Your "Chinese Lantern" is ready. Cut a rectangular strip (dimensions: 6 inches long and 1/2 inch wide) out of the construction paper . Glue or staple this strip across one end of the lantern and you have a handle for your lantern. Make a lot of lanterns in a similar way. String them along a length of yarn to make a colourful decoration for your room!